Abstract—This paper discusses an improved faint detection system. In the existing faint detection systems, tracking often fails if the object being tracked suddenly changes in its direction or shape. Authors propose a method to re-track the object for which tracking has failed in order to improve the accuracy and persistency of tracking performance. Therefore, it is possible to continuously track a certain senior citizen who lives alone by combining the tracking algorithm of Kalman filter and Camshift and detecting algorithm of blob labeling for images input from a thermal image camera. We propose a faint detection and response system based on the size change of the tracked trajectory and the change time. It can be found that the proposed system shows accurate faint detection through tracking. Index Terms—Faint detection, object tracking, Kalman filter, thermal image. Hanbyul Chae is with Information and Telecommunications Engineering, Suwon University, Korea. Juhyun Lee is with Bit Computer Corporation, South Korea. Kicheon Hong is with the University of Suwon, Republic of Korea (corresponding author; e-mail: kchong@suwon.ac.kr). 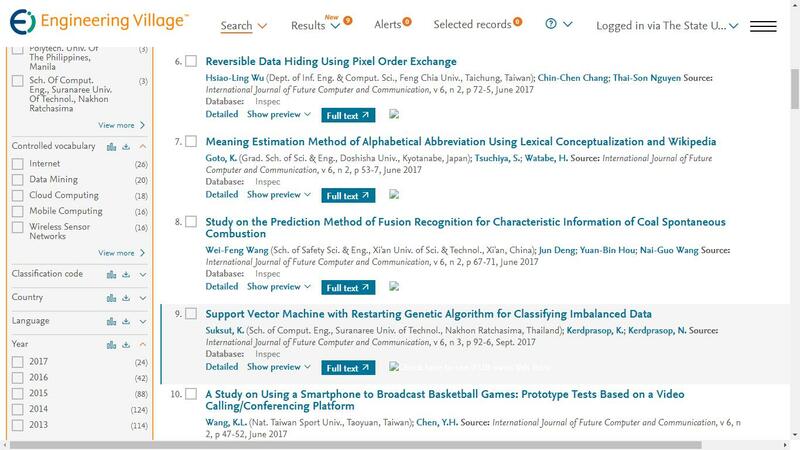 Cite: Hanbyul Chae, Juhyun Lee, and Kicheon Hong, "Development of Faint Motion Recognition System Based on Improved Objects Tracking Method from Thermal Camera Images," International Journal of Future Computer and Communication vol. 4, no. 4, pp. 275-279, 2015.